For last few decades, Internet has not only emerged as the resource for information but has also been claimed as the most reliable and effectual money making platform. From established businessmen to novice bloggers, all tech users are actively using internet to accomplishing their goal of earning some passive income. The only and the most advantageous method out of them all is building a Micro Niche Site. Never heard about Micro Niche Site before? No worries, continue reading this post and you will be knowing all about it till you reach the end. Building a micro niche site has become a new buzz amidst the bloggers and online marketers giving them a new tool to fill up their bank accounts. I didn’t brag at all; these websites are actually capable of bringing fortune to any businessman or any commercial/private establishment. (Here private refers small scale or community blogging accounts). In simple words, micro niche sites are money making tools that focus on a specific keyword of a given topic. Once a user inputs the keyword or any title containing the keyword s/he gets the maximum results of micro niche sites built on that specific topic. They are best for bringing in traffic and are highly effective for marketing. Moreover, these sites have a higher ranking on SERP making them perfect for building the credibility for any business site. They are believed to function faster than any other ordinary sites. Micro niche sites are among the best tools that help in advertising of other sites too as they meet all the requirements of Google’s Adsense. It is a fact that micro niche sites are easy to build and require comparatively low development and maintenance cost as compared to other ordinary sites. This is the first and foremost step involved in the process of creating a micro niche site. You need to select a niche (category) for your site; it can range from being a tiny jewelry piece to some big invention, or some specific car designs to simple home decor. You are free to choose a niche of your own choice (try to select the niche that you are most comfortable to deal with, if needed hire professional writers). The selection of niche is followed by picking up the domain name. Before moving ahead, check for the content you are going to add and work upon. Make sure you choose a topic that is and would be in high demand for a long period of time. And also, try to inculcate keywords that are capable of bringing in desired traffic to the website. Remember, doing a thorough research and development wouldn’t cost much but a failed approach might cost something big. So find the trends prevalent in the market and the strategies used by fellow micro site owners. Hosting- You must choose a reliable hosting that secures and processes the functioning of your micro niche site effectively. Select an established hosting provider that holds a profound experience in proffering hosting services. Themes- An attractive site with influencing content is highly impactful to generate desirable traffic and ROI. Buy from CodeCanyon, Themeforest, etc. ; the leading marketplaces for purchasing themes. Plugins- Do not miss to add functionality to your micro niche site by integrating some useful plugins. Write an average of 15-20 articles with long tail keywords with relevance to the main keyword. This should be done within a span of less than 4 weeks. Remember to keep the article simple and to the point. An efficient optimization of the site according to the SERPs helps in getting it ranked high on search engine giants like Google, Yahoo, etc. Include both On page and Off page SEO by writing unique articles, using keywords in the headings and introductory paras, maintaining keyword density, adding image ALT tags, and also by guest blogging, creating infographics. Now that you are done with all the major steps to begin your micro niche site, you just need to monetize your blog so that it can help you reap money. Out of the various ways used for making money, Google Adsense stands atop. Though getting Google Adsense is not so easy but you can still use some other ways like affiliate marketing, sponsored reviews, infolinks, direct advertisements, etc. 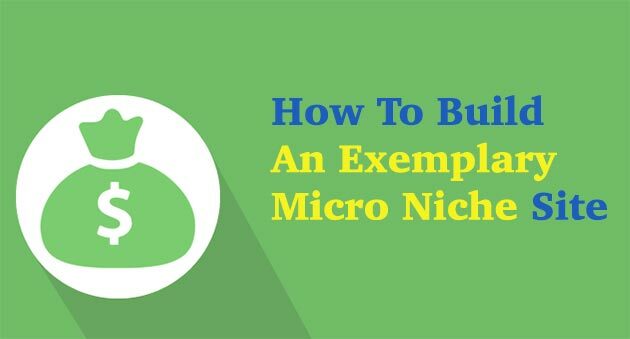 Conclusion: These steps are the building blocks that help in creating a micro niche site. As a site owner, you must maintain the consistency and proficiency in all the functions done within the site. Moreover, an effective planning with proper time investment can double up your efforts of minting money out of blogs. Clyde Ray is a renowned blogger and SEO analyst at a leading PSD to Drupal conversion service provider - PSDtoDrupalDeveloper. He loves to write various articles in his field of interest and profession. His informational write-ups are popularly followed by tech users and various site authors.